Attitude can overcome incredible challenges. The Human spirit can accomplish things we believe impossible. Look at how the mind, willpower can change a life. “D. Danner and his colleagues studied the longevity of a group of 178 Catholic nuns born in the early twentieth century. They lived in the same convent and taught at the same school in Milwaukee. Their case is particularly interesting because the outward circumstances of their lives were remarkably similar: the same daily routines, same diet, no tobacco or alcohol, same social and financial status, and, lastly, same access to medical care. These factors eliminated many variables caused by environmental conditions. The researchers analyzed the autobiographical account that each nun had written before taking her vows. Psychologists who knew nothing about these women assessed the positive and negative sentiments expressed in their writings. Some had repeatedly mentioned that they were “very happy” or felt “great joy” at the thought of entering monastic life and serving others, while others manifested little or no positive emotion. Once the nuns were classified according to the degree of joy and satisfaction expressed in their brief bios, the results were correlated with their longevity. It turned out that 90 percent of the nuns placed in the “most happy” quarter of the group were still alive at eighty-five, as opposed to 34 percent of those in the “least happy” quarter. no link was established between the nuns’ longevity and the strength of their faith, the intellectual sophistication of their writing, their hopes for the future, or any other parameter that was considered. 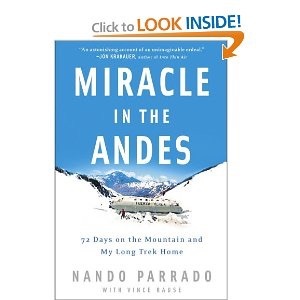 Nando Parrado, is credited with saving 16 lives after his rugby team crashed in the Andes. After a week of searching, rescue efforts were stopped, everyone gave up except one soul, Nando. A second tragedy, an avalanche struck the plane killing another seven or eight survivors. This event compelled one man, Nando to envision going for help. They were on the opposite side of the Andes than reported. Everyone else had given up, resolved to freeze or starve to death. Nando, kept a mantra of, “ as long as I have breath I will die one step closer to my father. No one would even commit to accompanying him. They left Uruguay in 90 degree heat, unprepared for life in the high Andes. All they had was the contents of that airplane. Nando and a friend walked out of that mountain range and brought back help. Remarkedly, Nando had to ride in the helicopters, get back in a crash situation, to rescue the other survivors. Professional climbers were barely able to navigate the route Nando took, prepared, outfitted in the correct climbing gear. No one knows how he was able to walk out of there. As it is called “A Miracle in the Andes, is appropriate. So, One persons attitude, a singular soul saved 16 people with willpower alone. “In the elderly, feeling a sense of responsibility has been found not only to improve daily functioning but also to increase lifespan. In a study of nursing home patients by researchers Ellen Langer and Judith Rodin, residents on one floor were given a plant for which they themselves were expected to care (the experimental group) while residents on another floor were given a plant for which their nurses would care (the control group). After three weeks, 93 percent of residents in the experimental group showed an overall improvement in socialization, alertness, and general function; in contrast, for 71 percent of residents in the control group functioning actually declined. And in a follow-up study eighteen months later, half as many of the residents who’d received plants for which they were expected to care by themselves had died as the residents who’d been given plants for which their nurses cared. Finally, perhaps the most significant way in which embracing a sense of personal responsibility increases resilience is by motivating action (remember, resilience is also defined by our ability to persevere through obstacles). In fact, feeling responsible for achieving an outcome may motivate us even more powerfully than our desire to achieve it. A good attitude with trust is very difficult when I leave the house, one thing that helps me is gratitude and looking for things to appreciate when I am out of the house. My gratitude practice began with a very slow start 3 years ago and now flows freely like a river. surprised. Great, great post. 🙂 A worthwhile and enjoyable reading experience on attitude — it determines just how far we go in life, and it’s up to us to cultivate a “can do,” selfless and others-oriented mindset geared toward helping others — in so doing, helping the self. Thanks for sharing your insightful posts here, Marty. It is much appreciated. Happiness and continued success to you.